Apple has finally unveiled the latest iPhone models. One of the new models is an iPhone XS Max which features the largest display ever on an Apple smartphone at 6.5 inches; it also includes wireless charging, a faster version of Face ID unlocking, and is made with surgical-grade stainless steel bands. 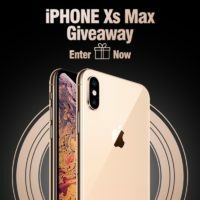 For a chance to win your very own Apple iPhone XS Max in gold with 256GB storage, simply enter this free international giveaway using the link below.